Wicca has been the big success religion of the past ten years, apparently helped in its spread by the internet. As both Tibetan Buddhism and Wicca are growing rapidly in the English-speaking countries, there will come a time when there will need to be an interfaith dialogue between the two paths. The purpose of this article is to examine the similarities and differences between Wicca and Tibetan Buddhism. But first to dispel the misinformation. There is a great deal of misinformation about both Wicca and Buddhism spread by Abrahamic fundamentalists. Wiccans are portrayed as baby-blood drinking Satanists, and Buddhists as self-obsessed. If there is to be a dialogue between the two, then each must rid itself of any divisive stereotype of the other derived from Christian fundamentalist propaganda. Despite what Christians may claim, Wicca has nothing to do with Satanism. Wiccans no more believe in Satan than do Buddhists. Satan is a bogey-man dreamt up by Christian theologians to explain why, if God is both loving and omnipotent, there is evil in the world. Satanism is thus an offshoot of Christianity, and many of its rituals involve perversions or parodies of Christian rites. Wiccans do not sacrifice any living thing, human or animal. They are specifically forbidden to cause harm to sentient beings and they believe in threefold karma - any evil they do will return to them three times over in this life or future lives. Neither do they drink blood, indeed many are vegetarian. Wiccans may be organised into covens, though many are solitary practioners. The belief that a coven must have thirteen members is a pernicious fiction spread by Christians in order to associate Wicca with Satanist parodies of Christ's Last Supper. Wicca has its origins in ancient Celtic beliefs and pre-dates both Christianity and Satanism. Christian disinformation about Buddhism has become more circumspect since the Pope added a new dimension to the term 'Papal Bull' in his embarrassing comments in Crossing the Threshold of Hope. As there is a greater public understanding of Buddhism than Wicca, gross distortions simply will not be believed. Nevertheless, there are still Christian attempts to portray Buddhists as pessimistic, life-rejecting, illogical and seeking total extinction. The Bodhisattva ideal is usually ignored. Wicca is a pagan healing religion. In pre-Christian times the knowledge of the healing power of herbs and psychological healing techiques was the province of the wise woman (or sometimes cunning man) of the village. Throughout the Middle Ages most of rural Britain, especially the wilder western Celtic areas, was only nominally Christian with ancient folk beliefs continuing to thrive. It is interesting to note that the word 'pagan' derives from the Latin for 'countryman', and 'heathen' from those who live on the heaths (the heather-clad fells and moors of western Britain). Towards the end of the Middle Ages political unrest, religious schisms and plagues led to a period of paranoia when all dissent was punished with the utmost severity. Many hundreds of thousands of traditional healers (and some early scientists) were arrested and burnt at the stake for being in league with the devil. This period is known as 'the burning times' by modern Wiccans. The old beliefs went underground and survived in isolated areas of Britain and Ireland from the end of the sixteenth century until the repeal of the anti-wiccan laws in 1951 (Wicca was still illegal in Britain until after World War Two !). The religion slowly emerged from obscurity and re-established strongholds in its traditional Celtic homelands (for example Glastonbury - the original Avalon of Merlin and the Arthurian legends). It arrived in the U.S. sometime in the late 1960's and found a fertile field for growth in the hippy counter-culture of that period. Its growth then appears to have been steady but unspectacular until the mid nineties, when a combination of cultural factors and the growth of the internet led to a massive increase in numbers. There may now be as many as three million Wiccans and Wiccan sympathisers through the English-speaking world. Wiccans in the U.S. are still subject to prejudice, and many of them dare not 'come out of the broom closet'. The situation in Britain is normally more tolerant, as paganism in some parts of rural Britain has never been far below the surface. Wicca is not a patriarchal or oppressive religion. There is no jealous, punitive sky-God. Wicca particularly venerates the feminine aspects of spirituality. The feminine is worshipped as the earth (most Wiccans are committed environmentalists), the moon, or as Goddesses drawn from ancient Celtic and other religions. The Lady Tara with her twenty-one aspects and rich, resonant imagery is an especially popular object of veneration. Almost all the information about ancient Goddess worship in Britain was destroyed by the church long ago, and Tara is seen as providing the archetype of enlightened feminine compassion and spiritual wisdom (See 'Liberation from Sorrow 'and 'Great Compassionate Mother' published by Tharpa). This is obviously one thing that Buddhists and Wiccans have in common. There is also a male god figure in Wicca, sometimes known as Herne, Cerrunnos or The Green Man, but he is usually of secondary importance and some feminist covens worship only the Goddess. Similarities between Buddhism and Wicca. The veneration of Lady Tara by both Wiccans and Buddhists has already been mentioned. Like Buddhists, Wiccans believe in rebirth. They also believe in karma (the harm you do returns to you threefold). Some Wiccans apparently believe humans can only be reborn in the human realm, while others appear to recognise the possibility of being reborn in the lower realms. (The original Celtic festival of Halloween was a time of the death of the old year when the veil between this realm and the others was at its thinnest. Ghosts and hell beings were said to be visible at this time). '...and it harm none, do what you will' summarises Wiccan ethics. To a Buddhist this may seem a little limited. The Wiccans try to eliminate the negative, but they don't actually accentuate the positive. For example, there don't seem to be any practices aimed at the deliberate cultivation of compassion. There does not seem to be any conception of a spiritual path as such, or at least of one leading out of samsara (the cycle of death and rebirth) to ultimate enlightenment. The Wiccans appear to be content to remain within samsara and there is no realisation that the wheel of rebirth has the ultimate nature of dukkha. It is impossible to debate the Wiccan philosophy, simply because there is no Wiccan philosophy! Topics such as dependent relationship, the nature of existence, the nature of the mind and the origin of suffering are just not addressed. Wicca does not seem to have any views either way in the creationism/evolution debate, and does not present any apologetics or logically coherant opposition to materialism. What are the reasons for the immense popularity and rapid growth of Wicca? Why does it attract so many young people? Candlemas on February 1st - 2nd. Offering of lights to the Goddess in the aspect of the Maiden. Lengthening of the days becomes perceptible. Beltane or May Eve on April 30th - May 1st. A fertility festival. Offerings of garlands to the Goddess in the aspect of the Mother. Lammas 31st July - 1st August - beginning of the harvest. Halloween 31st October. The death of the year. Festival of ghosts and spirits. Fires, lanterns and fireworks. The turning of the year also symbolises the processes of birth, death and rebirth of the individual. To the jaded city-dweller, these ancient numinous festivals with their evocative names and customs seem to offer a glimpse of a long-lost pastoral idyll . In fact the way of life in ancient communities was probably just as stressful and vastly more uncomfortable than the modern urban habitat. A cynic might detect a certain aspect of 'Celtic Twilight' romanticism about Wicca. The grass was always greener back then, and nowadays even nostalgia isn't what it used to be. But then that's maybe just the workings of impermanence and dukkha. There is no place for the feminine aspects of spirituality in standard patriarchal monotheism. However Wicca celebrates the divine feminine with colorful ceremonies, symbolism and rituals. (Many Wiccans are accomplished artists and designers). The non-macho nature of Wicca extends to welcoming gays and lesbians, who are still treated as abominations unto the Lord by some of the traditional patriarchal religions. The lack of any philosophical basis for Wicca is a double-edged sword. On one side there's no coherent intellectual structure, but then again there's nothing to disagree with. You aren't expected to believe six impossible things before breakfast. In an age of fundamentalism and Biblical literalism this has obvious attractions. Buddhism and Wicca - the future. - What can the Wiccans learn from Buddhism? - No path out of samsara. - No techniques for removing delusions or bad karma. - Little or no emphasis on compassion. - No reference to the possibility of rebirth in the lower realms. - Little or no emphasis on meditation and working with one's mind. 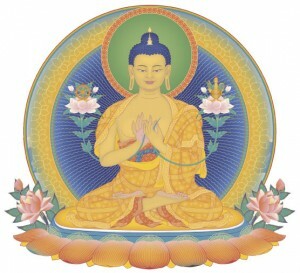 - No concept of the bodhisattva ideal. - Ethics consists of avoiding negative actions without necessarily attempting to cultivate positive ones. Though Buddhists do not attempt to push their beliefs down people's throats, it is probably worthwhile being aware of these limitations if one is ever in the position of trying to explain the dharma to Wiccans. It is also useful to remember that the Wiccans may have gathered their preconceptions about Buddhism from Christian sources. From a Buddhist point of view, the Wiccan path doesn't seem to lead anywhere, though with skillful means it could perhaps be extended to lead to the dharma. A useful point of contact between the two belief systems could be the mutual veneration for the Lady Tara. - What can Buddhists learn from Wicca? In terms of content probably not much. In terms of presentation perhaps quite a lot. Wicca's numinous qualities derive from its emphasis on seasonal festivals, which have deep and ancient resonances within Anglo-Celtic culture, and indeed most of the cultures of northern Europe. The long northern winters and their meagre hours of daylight, which are counteracted by festivals of fire and light, provide a powerful archetypal symbolism.